Made by Radio Corporation of Australia. 2 to 10 MHz, AM/CW/MCW. Although these were normally installed in the ship's W/T room, they also had a remote control unit mounted in the Bridge which allowed communication direct from there. Frequency selection and tuning, however, had to be carried out at the set itself. RX: Covers frequency range in 2 bands. RF amp=1M5, Osc/mixer=1C7, 1st IF=1M5, 2nd IF/Det=1K7, 1st AF/BFO=1C7 and Output=1L5. Made by STC (Standard Telephones and Cable), another of the reverse Lend-lease units which were also used by both the Australian Navy and Air-Force. Covers 1.5 to 24 MHz in 4 Bands. 455 kHz IF. 1st RF=6U7, 2nd RF=6U7, Mixer=6K8, 1st IF=6U7, 2nd IF/Det=6G8, AF amp=6B8, AF output=6V6 and BFO=6J7. 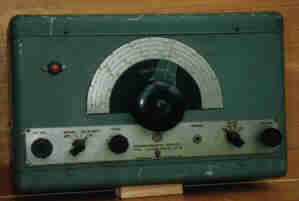 One of many receivers which looked very similar (including the receiver used with the 3BZ transmitter by the "COAST WATCHERS"). 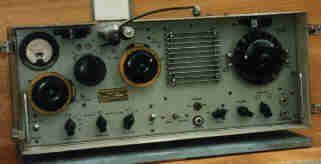 This shipboard receiver has an emergency Crystal Set installed internally for use on 500 kHz. Made by AWA. 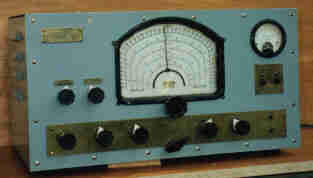 Covers 100 kHz to 3 MHz in 4 bands. 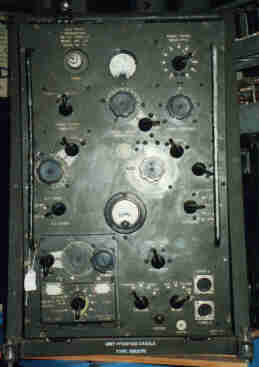 Made by AWA, again for reverse Lend-lease, was previously known as the TW-12 transmitter. This example has U.S. Navy nomenclature NA-CD-M564-44 - AMT-150. Also known and used by RAAF as the AT-21. It was normally mounted, by means of shock mounts, in a tubular frame which in turn, mounted on top of it's associated power supply. Covered frequency range of 1.5 to 16 MHz continuous or Xtal channels, AM/CW/MCW. Power output up to 17 Watts AM or up to 50 Watts CW. Modulator/Tone osc=6V6, M.O./Xtal Osc=6V6, Buffer/Doubler=807 and Power Amp= 2 x 807 in parallel.